When you hear the word ‘spring’, I bet the first thing that pops up in your mind isn’t something like ‘fennel’. Something more along the lines of ‘ramps’, or perhaps ‘asparagus’ or ‘peas’ is more commonplace. Perhaps this recipe may change your mind? It’s one of those vegetables that doesn’t seem to get much respect. Here, it’s sliced paper-thin and tossed with celery and shaved Parmigiano-Reggiano cheese, in an elegant salad that’s perfect as an appetizer or starter course for either a light lunch or dinner. Best of all, you can make this in 20 minutes, including prep. Slice the fennel into paper-thin slices. You can do this by hand if you wish, or with a mandolin. If you elect to use a mandolin, be sure to use a hand guard to protect your hands from injury. Using a mandolin will help ensure that the slices are of uniform thickness. 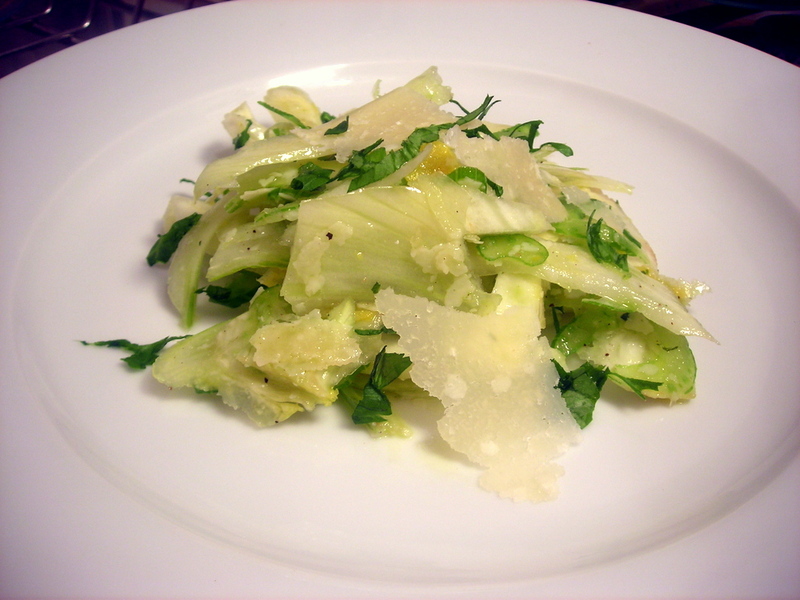 Combine the fennel and celery slices in a large glass bowl. Using a vegetable peeler, shave thin strips of Parmigiano-Reggiano cheese over the vegetables; about 1 ounce is sufficient but feel free to adjust according to your own preference. Toss a few times. In a small bowl, combine the extra-virgin olive oil, lemon juice, lemon zest and celery leaves. Taste for salt and pepper. Mix well. Spoon a few tablespoons of the vinaigrette onto the salad and toss together, to ensure that the vegetables and cheese are lightly dressed. Spoon salad onto individual salad plates and serve at once. This is my contribution for Souper (Soup, Salad and Sammie) Sundays for the week of May 28, 2012 to June 3, 2012, a weekly foodblogging event organized and hosted by Deb of Kahakai Kitchen. 24 May	This entry was published on May 24, 2012 at 11:33 am. It’s filed under cooking, food, food photography, Gluten-Free, Italian food, recipe, Souper (Soup, Salad & Sammie ) Sundays, spring, vegetarian and tagged appetizer, celery, dinner, fennel, food photography, gluten-free, salad, vegetarian. Bookmark the permalink. Follow any comments here with the RSS feed for this post. I enjoy the most your entries on vegetables and how to make them interesting and fun, rather than the plain (often badly cooked) nasties on which I grew up.